This product requires the base game Wings of Prey. 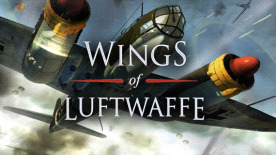 In Wings of Luftwaffe, the player takes the role of a German pilot and participates in explosive battles over Britain, Sicily, the USSR, Belgium and Germany. From blocking airdromes, to attacking aircraft, to destroying ground targets, the player will fight with honor and bravery for the glory of Germany. These new missions allow virtual pilots to see the war from the enemy's point of view and try out some of the most advanced fighters of the era. This expansion will feature ten single missions with support for up to four players in co-op mode, two new planes and over 40 skins for the various planes. 44 new skins for the various planes. Wings of Prey is required to play this DLC.